The tiny Caribbean nation of Antigua and Barbuda has again vowed to implement a plan to collect on the $21 million annual judgment awarded to it by the World Trade Organization and against the United States over a decade ago, over the US’s failure to allow its citizens to gamble openly on Antigua-based sites. Late last year, the Gaston Browne-led Antiguan government confirmed its plans to collect the judgment in the form of abrogated intellectual-property rights, as ordered by the WTO. As a reiteration of that vow, Sir Rodney Williams, Antigua’s Governor-General, stated again that a plan to collect that judgment will soon be put before Antigua’s Parliament. Antigua and Barbuda has tried varying tactics over the past 12 years to collect on the judgment, though the US has scoffed at the notion that it must pay anything at all. The judgment, now roughly a quarter billion US dollars with interest, was granted when Antigua prevailed in its claims that the US had violated the late-’90s GATS treaty with Antigua and other nations by refusing to allow Antigua-based gambling sites access to the US market. Antigua’s WTO representative promised a couple of months back to submit the country’s outline for collecting the judgment to that Brussels-based international body, but as of the end of the year, no such concrete plan had been submitted. One of the greatest challenges facing my country’s diplomacy is the resistance which Antigua and Barbuda has encountered from its great friend and neighbour, the USA, in the outstanding WTO matter. 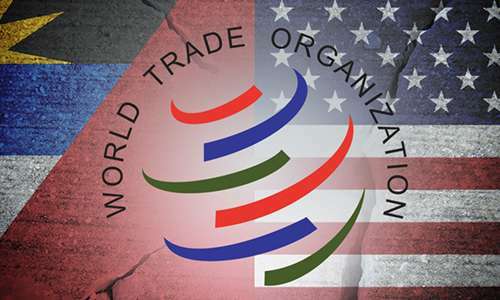 Having successfully prosecuted our case at the World Trade Organization more than 12 years ago, and having been awarded US $21,000,000 (twenty-one million United States dollars) annually by the world body, getting the USA to make good on its obligations has been impossible. For more than 30 months, my Government has tried to get the USA to come to a meaningful settlement. It was my Government’s view that a settlement would have been achieved before the Obama Administration demitted office on January 20, 2017. That date will soon pass. Consequently, it is the intention of my Government to apply the remedies permitted by the WTO. It is my Government’s intention to proceed to Parliament to adopt legislation consistent with the WTO ruling, allowing Antigua and Barbuda to nullify US copyright protections and to benefit from so doing. The USA is a very powerful and wealthy state, capable of inflicting harm. My Government believes that the new administration that is about to take office will recognize the lawfulness and justness of our actions and will quickly settle the differences that have kept our negotiators apart. The USA would not turn to intimidation and revenge. The last paragraph can be seen as pipe dreams and blue sky, given the US’s unwavering recalcitrance regarding the WTO judgment. Given the strident anti-gambling stance of several prominent incoming Trump Administration officials, notable US Attorney General nominee Jeff Sessions and Vice President-elect Mike Pence, it’s hard to imagine the Trump people being more likely to settle with Antigua than were Obama administration officials.